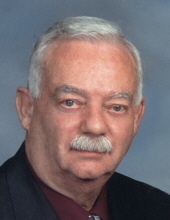 Russell Lee Dameron, 75, of 5017 Jefferson Road, Danville, Va., passed away on Tuesday, October 9, 2018. He was born May 23, 1943, in Danville to the late Dorothy Milam Dameron and the late Thomas Fielding Dameron. He is survived by his wife Charlene Hankins Dameron. Mr. Dameron enjoyed collecting coins and watching old movies. He also liked traveling. Mr. Dameron was the owner of Dameron Fire Co. In addition to his wife, Mr. Dameron is survived by his sister-in-law, Debra Hankins; his brother, Hodges Dameron; as well as several nieces and nephews. In addition to his parents, Mr. Dameron was predeceased by his son, Russell Dale Dameron; his mother-in-law, Willie Hankins; as well as two brothers. Funeral services will be held at 10:30 a.m. Saturday, October 13, 2018, at Norris Mt. Hermon Chapel, with Rev. Wayne Aaron and Rev. Marcus Heffinger officiating. Interment will follow at Zion Methodist Church Cemetery, Gretna, Va. The family will receive friends from 7 p.m. to 8 p.m. on Friday evening, October 12, 2018, at Norris Mt. Hermon Chapel, and at other times at the residence. Norris Funeral Services, Inc. & Crematory, Mt. Hermon Chapel, 3995 Franklin Tpke., Danville, Va. is respectfully serving the Dameron family. Online condolences may be made at www.norrisfuneral.com. To send flowers or a remembrance gift to the family of Russell Lee Dameron, please visit our Tribute Store. "Email Address" would like to share the life celebration of Russell Lee Dameron. Click on the "link" to go to share a favorite memory or leave a condolence message for the family.